CITEC disc wheels - unbeatable aerodynamics! Extremely light-weight for faster acceleration. No loss of breaking force due to machined aluminium breaking surface. There is no faster alternative when competing against the clock! - Duraluminium rim with trapeze profile for tubulars or clinchers. - Pre-tensioned carbon-fibre reinforced CFK skins bonded to the aluminium rim. - Machined rim breaking surface for positive breaking action. - Extremely high radial and lateral tolerances due to the sophisticated manufacturing process. - Extremely high lateral strength while maintaining radial elasticity (comparable to a spoked wheel). - Fast acceleration due to low inertial coefficient. The unique rear hub uses the proven DT Swiss cassette carrier and clutch mechanism for Shimano 8/9/10/11 speed or Campagnolo 9/10/11 speed cassettes. 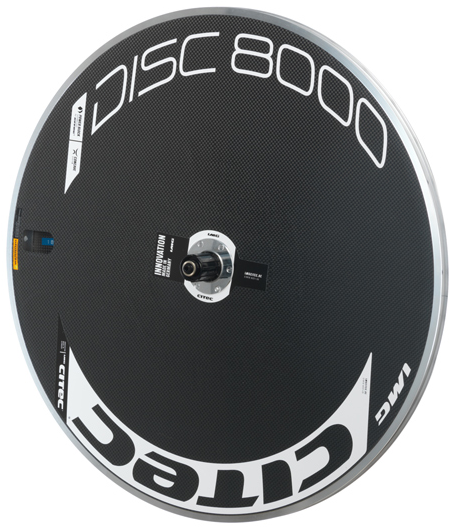 OUR TIP: Combine the Disc8000 with the 8000CX Carbon front wheel for a truly unbeatable wheel set! Please note, due to their popularity delivery times may be rather lengthy, please enquire. The world`s lightest disc wheel for tubulars now only 725 grams! Even further weight reduction by using the highest quality super-light carbon fibre cloth available. Bonded and pre-tensioned onto re-designed and lightened trapezoid rim allows for maximum acceleration. Hub and cassette carrier are running on high tolerance super smooth bearings. There is no faster wheel when competing against the clock! - Duraluminium rim with trapezoid profile for tubulars or clinchers. - Pretensioned carbon skins bonded to the aluminium rim. - Machined aluminium breaking surface for positive breaking action. - Extremely high radial and lateral tolerances due to our sophisticated manufacturing process. - Faster acceleration than Disc8000 due to low inertial coefficient. The dedicated rear hub uses the proven DT Swiss cassette carrier and clutch mechanism for Shimano 8/9/10/11 speed or Campagnolo 9/10/11 speed cassettes. 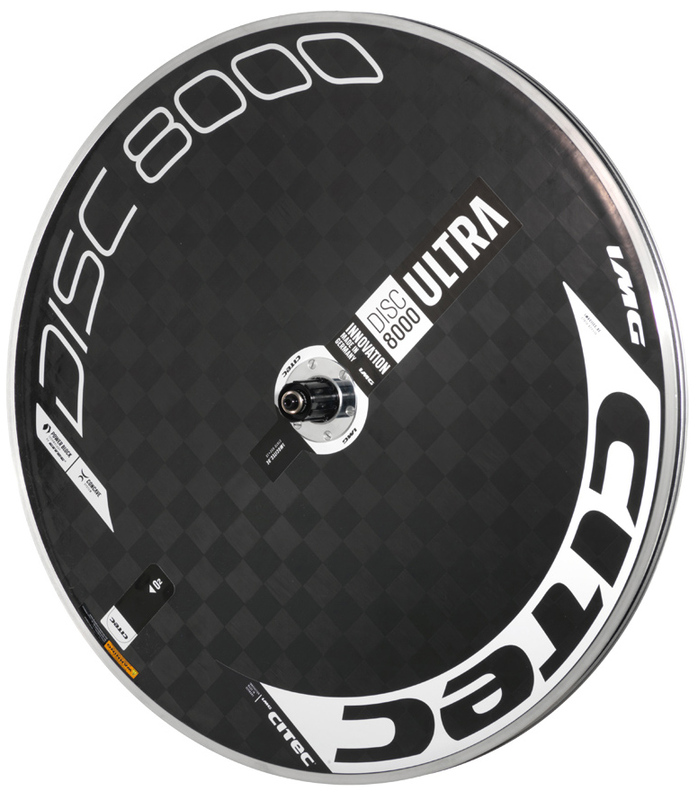 OUR TIP: Combine the Disc8000 Ultra with the 8000 ULTRA Full Carbon front wheel for the ultimate unbeatable wheel set!